First, you choose your horse's name and it's color. You play as a girl named Emma that goes to her Uncle's farm. All the horses are sick. Why? You'll figure it out when you finish the game. Shop for clothes and tack, brush and bathe your horse, pick its hooves, apply leg wraps, massage it,feed it clean your horses stall, and of course ride. You train in dressage, jumping and cross country. After that you can go to the show. After you win the Kentucky show the game is pretty much done. You can still ride and everything, but there are no more shows. How do I get my horse and me? How do I get my horse and me? 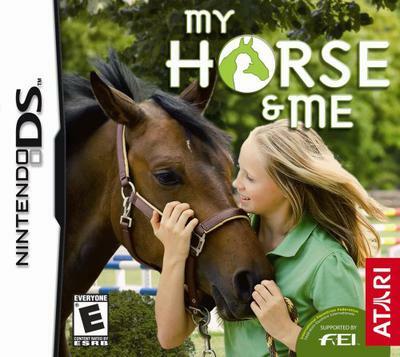 I want it for my PC and of course I love horses and I never played this game. This is my fave horse game ever! I got this game because I love the ride-and-take-care-of-me type games. You DO get many traditional features-jumping, care taking, atc-and a few nontraditional aspects, such as a game where you corral huge beach balls in between two "goals" on the field for points. Overall great, but I will give it a four simply because the horses DO NOT like to turn at first-on the Cross country courses this is very annoying! How would u download a DS game? Some people dislike the graphics, however on DS i quite like the graphics:-) It's an average game where you train and look after your horse, you can customize and take part in some really fun shows and riding activities! The music is also nice! This game sounds really good! I have 3 horses myself and the game sounds very realistic!! This is quite a popular game so don't let this stop you from getting it. I got it 2 Christmases ago and it took me 1 hour to complete. It's not really much fun and the end is quite boring. But most other comments are saying its great, so just different opinions! this game sounds awesome but i don't know how much it is. please answer. Note from Sydney: You can click on the image and check out the price or even buy it from Amazon. There is another awesome game that's not mentioned, there are 2 but they are almost exactly the same but the better one is called Ellen Whitakers horse life. You can enter shows and get lessons on how to do different gaits and the height of jumps also (because its set in England) go to America and can choose to compete with their mustang or your own horse (which to get to customize at the start). Is the game fun when it ends???? Does anyone know any other game that's not on this website? this game is awesome and it is so good for our age ...... WoW ......it is totally cool!! !